Follow these steps to determine which step fails and how to fix it. If you think you have done the right setup, there is a simple way to check that everything is correct. It is not enough to check interactively on the render node that the variable is set. Indeed some render farm manager will replace the node environment before launching a new render. The only way is to render a specific file through the render farm manager and check the log to the what the environment variables values really are. Save this file, and render it on the farm. This scriptnode will launch the system("set") command when the file is rendered, and then output the full environment variables list and their values in your logs. 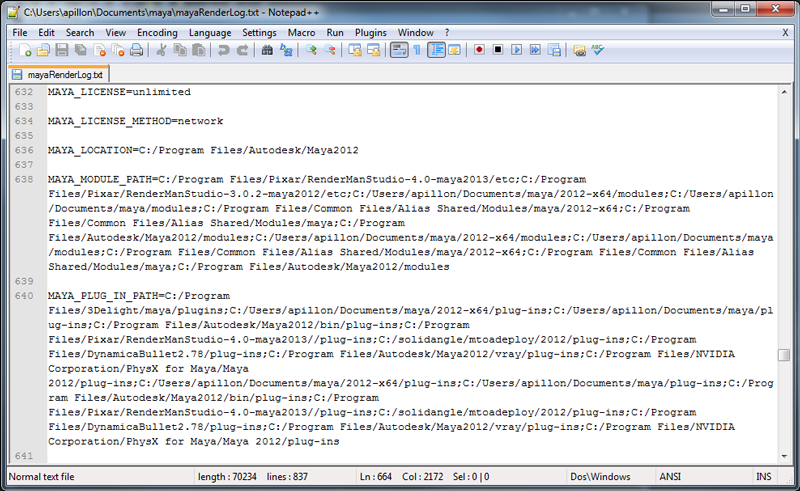 Check that the MAYA_MODULE_PATH is set and really points to your Golaem installation root directory. Find the complete log outputted by Maya (the location depends on how you are dispatching the render on your farm). Error: line 1: RuntimeError: file <maya console> line 1: Plug-in, "glmCrowd", was not found on MAYA_PLUG_IN_PATH. In this case, it means that the Golaem maya plugin is not reachable by the node, or that (contrary to what Maya says) the MAYA_MODULE_PATH variable is not set correctly. Each renderer report that it has found and loaded the Golaem Procedural plugin or NOT in the render logs. Do not worry about the "Unexpected MATERIAL" error. The related line is a Mental Standalone specific parameter, which is ignored by the Maya version. [2014/Jan/8|16:59:44] V-Ray: Loading plugins from "C:\Golaem\GolaemCrowd-3.0.15-Maya2014\procedurals/vray_*.dll"
00:00:05 451MB ERROR | [proc] CrowdProxyArnold1Shape: error reading dynamic library from glmCrowdArnoldPlugin.dll: The specified module could not be found. If the Golaem Procedural plugin is not found, you need to check that the environment variables related to your renderer are set correctly. They should be automatically set when the golaem.mod file is loaded by Maya, but in some cases, the dispatcher is overwritting them. In this case, set them explicitely in your dispatcher configuration, the same way you have set the MAYA_MODULE_PATH variable (but pointing to the procedurals/shaders directory instead, see environment variables list). Once you are sure that both Golaem Maya and Procedural plugins are loaded, you need to make sure that Golaem can find the file needed for rendering (.fbx, .gcha, simulation cache...). These files need to be reachable by ALL render nodes and referenced by there network path in the Maya scene. If rendering works on the artist's workstation and not on the farm, it may means that some of these files are available only on the artist workstation, or referenced through a path that does not exist on the farm. Error: [GolaemCrowd::ERROR] Golaem Core: Failed to load the character file 'C:/Golaem/GolaemCrowdSamples-3.0.14/crowd/fbx/CMO-man_golaem.fbx'. In this case, open the Asset Manager, and check the path used to reference the .fbx file. See Relocating the FBX file to know how to change this path. warn : [GolaemCrowd::WARNING] The frame '67' was not found in the simulation cache! Check the attributes of your render proxy to see how the cache is referenced, verify that the cache file has been created, and that it is reachable by the render nodes. Also check that the frame you are trying to render has been exported in the cache (always remember that frame 0 is never exported).